I had promised awhile back to post this dehydrated apple recipe, but it has taken me some time to deliver. As you can tell from this, I have been obsessed (a reoccurring theme) in recent years with the GoldRush apples. Golden Delicious has now taken the back seat. In the DC area, I have only seen the GoldRush at Farmers Markets. It makes the outing on a weekend worthwhile, even if only to pick up some apples, mushrooms and local cheese. For dehydrating apples I found over the years that most apples will work with an exception of one, the Granny Smith. I love the Granny Smith apples in baking, I won't substitute it with any other variety, but when it comes to dehydrating, they are my least favorite, one dimensional tart notes only. The dehydrated apples can have a softer rubbery feel but if you keep them in the oven longer they turn into chips. The apple chips shatter like thin glass at the faintest touch, it's really neat. 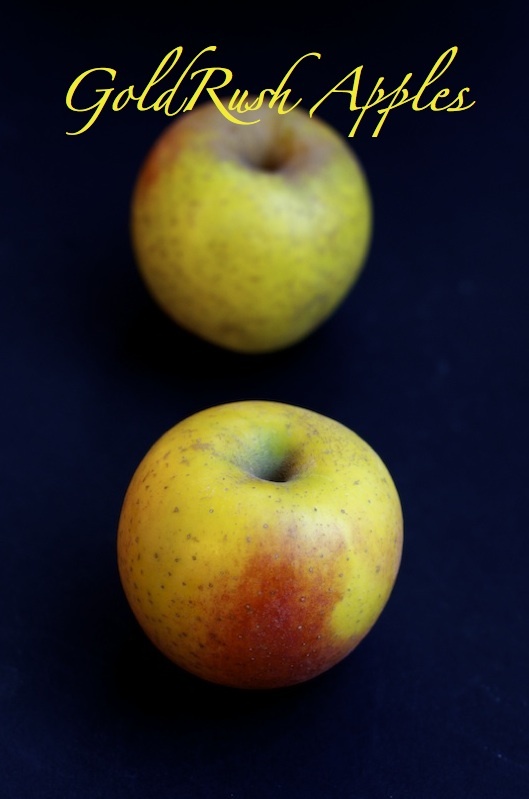 During the winter of 2011, as you can see here, I experimented with many apple varieties, you can also see the more subdued, serene tones to my photography as opposed to the more vibrant images in this post. Raw emotions bring out the bold but somehow I keep it simpler. Warning: An intense writing below, you can skip down to the recipe at the very bottom. I was debating whether or not to write about this, but raw and shatter pretty much sums up this week. Unlike the apple chips nothing about a life shattered is neat. Nothing about a loss of a life full of hope and possibilities is right. Broken into smithereens, turned into dust, like thin apple crisps. Nothing about a picture of a group of friends gathered in suspense, rumors swirling, keep calling their friend's cell, hoping, is ok. Intermittently someone bursts out crying. Emotionally exhausted. A creeping hopelessness shrouded with helplessness. A dark, hollow feeling. A dawning realization that their friend will never answer, his cell, again. Monday, January 21, 2013, this week, my son lost one of his very good college friends, Jake, 21, in a horrid off campus apartment fire. Sagie (pronounced Sa-gee. gee as in geese) is an only child so his friends mean the world over. Seems as though I know Jake through Sagie. Jake was an optimistic fellow, full of smiles. I can't imagine his parents' and siblings' gut wrenching agony and pain. Our son, Sagie (means exalted or a peak of a mountain) was always mulling over the question of life and death ever since he was a child. Something that always profoundly bothered him. the loss of a life, so absolute. Just something inherent, like when he was two, he was mesmerized by tires, an innate curiosity, both Jonathan and I, were lacking. We were never mechanically, or anything car, inclined. I mentioned in the past, Sagie's toying with having this one specific tattoo ever since his teen years. Then there was much research, discussion and question of the Jewish law. Throw into the mix my fears, as a mom, of an allergic reaction or an infection. Not to mention, tattoos, a completely foreign concept to Jonathan and me. Again, individuality, kids have a way of developing it. Self inflicted gashes in your flesh are forbidden according to the Jewish law and therefore being buried in an Orthodox Jewish cemetery will be banned. Exceptions are made to Holocaust survivors. You can be buried outside the cemetery fence with the 'impure and tainted'. I hear it is not completely true today in Reform and Conservative burial grounds, but still, does Sagie wish to take chances?! It's Tuesday, January 22, 2013, this week, all up at UMASS Amherst are stunned. Almost passive. Don't know what to feel but overcome with an overwhelming numbness. First day of the semester back, I was not going to ask Sagie if he is going to classes. He calls me later that afternoon his body in gashes. He tells me, it only made sense given the circumstances. He tells me, there is no better time than the present. He tells me, he had to do it. I tell him, I am proud but did he get a disinfectant? Later that day they gathered for an informal memorial service that the kids organized on campus. Each sharing, his and her love and memories of Jake and deep grief. It was a non denominational gathering. They might or might have not have said the Mourner's Kaddish (prayer). The prose on my child's ribs say: "The only truly dead are those who have been forgotten" A Jewish proverb. Jake will always be alive in the memories of so many lives he has touched, on this little corner of my virtual pages and among you, to him, strangers. The funeral Mass will be held on Saturday, January 26, 2013. The kids are going. We thought of heading up north, but Sagie needs to go through this by himself, with this amazing supportive of each other group of his UMASS friends. Preheat oven to 200F. Core the apple with an apple corer. Peel and slice very thin with a mandoline. Lay flat on two parchment paper lined cookie sheets. 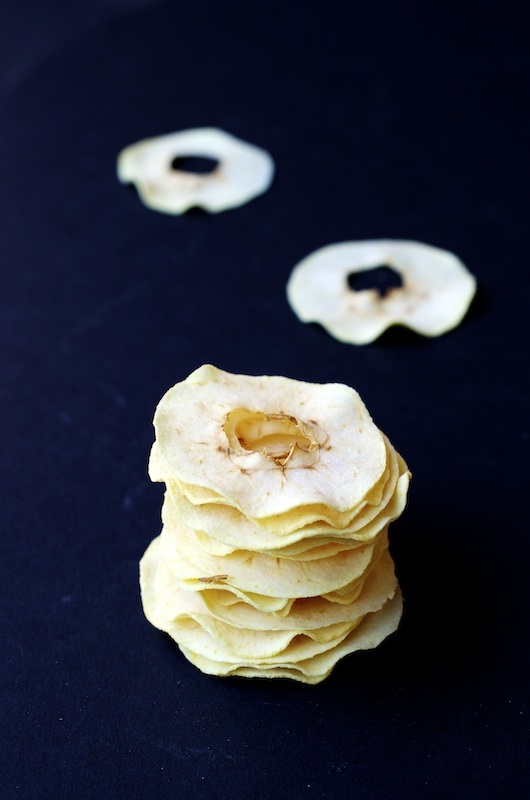 Let dehydrate in the oven for 2 hours for a soft dehydrated consistency or 3 hours for crispy apple chips. Flip apple slices with a spatula 1 1/2 hours into dehydrating. Store in an airtight container when cool. 1. Key is working in a timely, efficient fashion when peeling, coring and slicing, so apples do not oxidize. 2. Keep in mind ovens vary so adjust time accordingly. 3. I have tried the lower than 200F heat overnight in the oven method, but it takes about 8 hours, and I do not like to leave the oven on while sleeping. A touching post. I'm so sorry for your son's loss. That proverb is so beautiful and meaningful. Lovely chips! I bet they are addictive. TY so much Rosa. Very sweet of you! I was so sad to read about what happened at UMASS and I'm so sorry for your son's loss. Of course, I wanted to also tell you that these dehydrated apple slices look wonderful. Something I'd love to snack on in the middle of the day (instead of the chocolate craving I seem to get at around 2:30 every afternoon). Oh :(( Terrible tragedy... and only 21. God rest his soul. Your photos are just beautiful, as always. TY so much Kate. Tonight, a few weeks late they had a raffle to raise money for Jake's charity. My son said there was a huge turnout. It's very encouraging to hear that. I'm in tears reading this and realizing it was on my birthday day. How horrible for parents to lose a child so young. Such a touching post, the words stung my eyes and my throat is in a knot now. The comparison to the delicate apples - genius. As always, gorgeous photography Shulie. What an idea .. Awesome. Oh, Shulie... what a beautiful post. My heart goes out to Jake's family. I can not begin to imagine the pain they are experiencing. And my heart aches for your son. The proverb he has used is so true. Such a beautiful sentiment for the one who will never be forgotten. TY Dear Kim. I know, just can't imagine the heartache Jake's mom, dad and siblings are going through. & TY again! So sorry to hear about your son's loss. Didn't know Granny Smith wasn't ideal for making dehydrated chips. TY everyone for your kind comments. I was really shaken this week and I am a stranger. I can't imagine those who were the closest to Jake, his parents, brother and sister, extended family and friends. So sorry to hear about such a tragic loss of a young man - my prayers go out to his family and your son. Beautiful photos! If you've been following my tweets, posts here and on my site....Just spoke to Sagie and his friends. They spent the entire weekend at the funeral and visiting with Jake's close knit Irish family, near Boston. They sound good. I think the weekend was intense but being with Jake's happy family, with so many uncles, aunts and cousins and kids running around, sharing happy memories of Jake, helped. RIP Jake! You were magical! Shulie I am so sorry about Jake for his family and friends and for what you as a mother must be feeling. I definitely believe that we will be reunited with our loved ones one day and until then we can always remember and continue to love them. TY Rose. I think, just like you, Jake's family are Catholics and I think their faith is keeping them strong and optimistic as you just beautifully put it. Beautiful photography. Beautiful post. I am so sorry. TY Terra for all the positive vibes. I know, would be wonderful to make in advance of travel. Let me know when you do, Alison. Shulie, I am so very sorry for the loss of your son's friend. It's indeed absolutely shattering. My thoughts are with you and Sagie... Of course, you manage to do a superb post even when you are in pain! You are an inspiration... Thank you! TY Viviane, means a lot coming from you. It is so sad that Sagie lost his great friend. Too young. My thoughts are with Sagie and the family of his friend. A lovely post, Shulie. TY so much sweetest Lora. So sorry for the loss of your dad, too. Dear Shulie, I am sorry to read about this tragic loss of life... deepest sympathies to your son on the loss of his friend.